Sometimes the best pictures are between the shots. I love taking pictures of newborns. I am simply in awe when I am around them. I speak softly, as if I am in the presence of something pure and holy, and perhaps I am. Ava Marie was 12 days old when I captured these pictures. I’m a newborn photography newbie; this is only my third session. I do know that I want to photograph many more babies. Looking at this portrait, you might see a cute and sweet little girl sitting quietly on a stool. But look more closely. Look at the expression in her eyes and mouth. She is toying with the photographer (me), wiggling and striking silly poses. I will post maternity shots in a few days, in addition to newborn shots of Elle’s cousin. Remember the maternity portrait session? I captured these pictures an hour after the baby’s birth on Sunday, March 1. The next day, I got a few more pictures of Mother and Baby. Recently I posted a portrait of a young mother quietly waiting for the birth of her second daughter. Here are more images from that shoot. This family was fun to photograph because their love is strong and because they enjoy life. I know that this little baby will add to their joy. I feel blessed to have had the opportunity to photograph this beautiful young mother of an active one-year-old daughter who is due in less than two weeks. 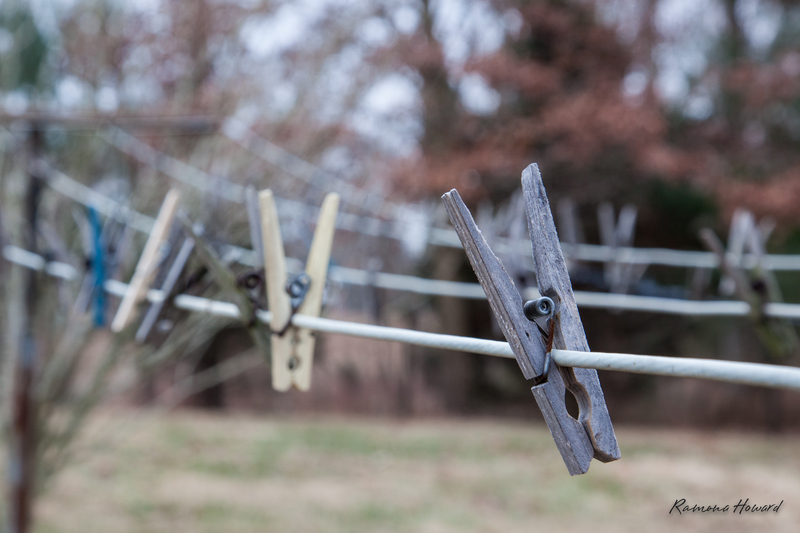 On this bitterly cold day, the clothespins quietly wait for spring so they can resume their work. The weather was simply too beautiful to stay inside today, so I took my camera out to a local park to photograph, just for the sheer joy of capturing the image. 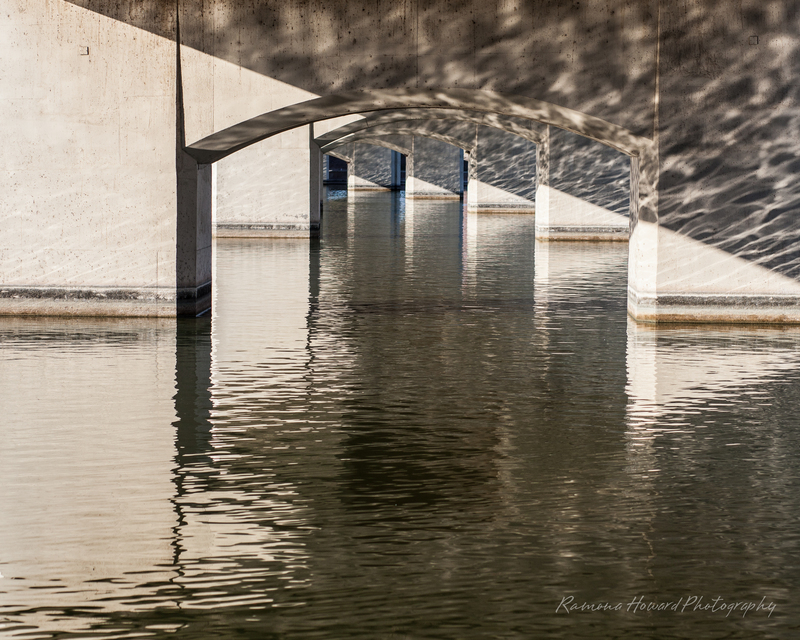 As I sat near the small lake, my eye was drawn to the reflections of the columns in the water; I then noticed that the ripples of the water are projected onto the columns, creating a double reflection. The symmetry of the lines and curves and the muted brown and grey tones brought to mind this line from the poem Desiderata (“essential things”). I jumped at the opportunity to practice newborn photography on a friend’s granddaughter; because I’m new at this genre of photography, I did the shoot for no charge. In preparation, I spent a considerable amount of time reading articles and blogs and watching videos. I also scoured local stores for inexpensive props after searching online and finding that those clever and cute baskets, headbands, and backdrops cost a fortune. I took these pictures with a minimum of props: a wicker basket, a gauze wrap, and a few furry blankets. On the day of the shoot, I loaded my CRV with my portable studio consisting of backdrop and backdrop stands, light stands, SpeedLites and umbrellas, cameras, tripod, and lenses, and a large suitcase of blankets and pillows. When I arrived at their house, I was delighted to find a large window that provided plenty of light and I was able to use ambient light rather than strobe. I love the effect of soft light and shadows on the baby’s face. I’ve studied the 517 images I shot that afternoon, analyzing what I did right and where I need to improve; I am now ready to slowly build inventory and I look forward to my first paying newborn client.